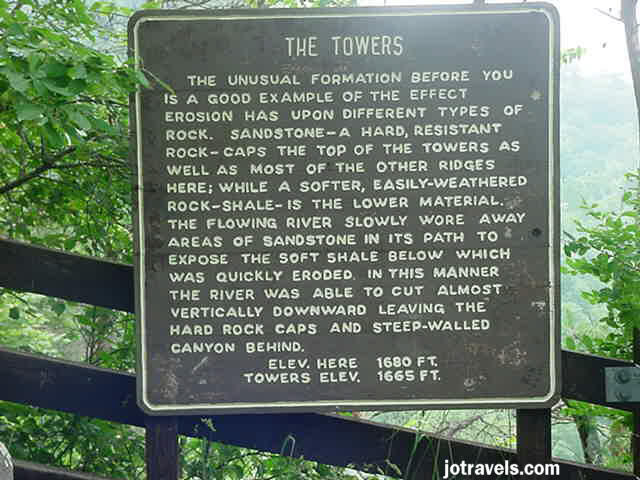 The unusual formation before you is a good example of the effect erosion has upon different tyes of rock. Sandstone - a hard, resistant rock - caps the top of the towers as well as most of the other ridges here; while a softer, easily-weathered rock - shale - is the lower material. The flowing river slowly wore away areas of sandstone in it's path to expose the soft shale below which was quickly eroded. In this manner, the river was able to cut almost vertically downward leaving the hard rock caps and steep-walled canyon behind.